People, all people, are 1.6 times more likely, per capita, to be shot and killed by police in states that are less than 10 percent black compared to states more than 10 percent African American. Blacks are still more likely than whites, per capita to be shot overall. But this ratio (2.6:1) doesn’t change significantly based on how black a state is. For both whites and blacks, the likelihood of being shot by police is greater in states with fewer blacks. And the difference is rather large. There are seven states less than two percent black. In 2015 and 2016, zero blacks were shot and killed in Maine, New Hampshire, Utah, Vermont, Wyoming, Idaho, and Montana. 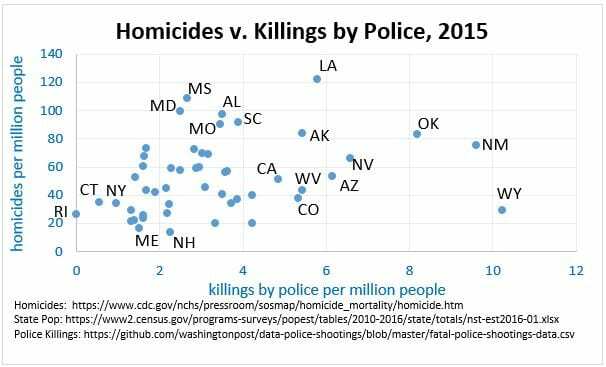 But if you think cops don’t shoot people in these states, you’re wrong. Compared to the four states with the highest percentage of African-American (Mississippi, Louisiana, Georgia, and Maryland are more than 30 percent black), the overall rate of police-involved killings in states with few blacks is higher. And this is despite a lower rate of overall violence. I can say that in my lifetime, I have not earned enough money for me to have kids. I’m 36. I know some have had kids on my income or less but it certainly is not enough money for me. I can’t imagine how it would have been if I had kids. I personally have never had the stability in my life where I thought it was okay for me to go off and spawn a family the way my parents did beginning in 1953. My father worked hard, and loved to work, had good employment and good pay, without a college degree. Where as, he sent me to private schools, I got honor roll grades, bachelors degree, doctorate degree, I re-engineered manufacturing systems at some of America’s largest companies, but still I never felt secure in my employment, nor was I.
I am unemployed now, as I was in 2010, as I was in 2006, as I was in 1991, as I was for a time in 1984, 1983 and 1982 – when I graduated. The current generation is facing a geometrically greater challenge than I did. So I can see why traditional family life is in decline. Interesting how the problem is the framed the same way at different ends of the political spectrum. I note that this framing also fits my life – my wife and I got married late and had one child (one and done) very late. Economic worries were a big part of the decision making process. On paper, my wife and I are doing relatively well financially, but we are extremely aware that a job loss – something that has become extremely common in recent years – or one financial mis-step could mean the difference between whether our son will have far greater opportunity in life than either my wife or I did growing up, or far less opportunity. There doesn’t seem to be much in-between. In talking with my parents, they also seem to believe outcomes are more stark for families today. Many of my friends tell me the same thing. And when I talk to people ten or twenty years younger than I, in general, their costs seem to be higher than those I faced, and the potential opportunities fewer. The result is that most people I know within ten years of my age have between zero and two kids. While there are exceptions, in general, people I can name with three or more kids either are in the top 2% or so, income-wise (and most of them are in finance or have inherited wealth or both), or are well below the median. (Note – I went looking for data on number of children by income level in the US but couldn’t find any.) I wonder if that’s a portent of things to come, and what it implies for the stability of society going forward. In Part 1, we looked at the ratio of consumption spending to net worth, and how it changed over time. This time we’ll look at the correlation between net worth and consumption. Notably, both the slope of the data line and R^2 are significantly less after the break. 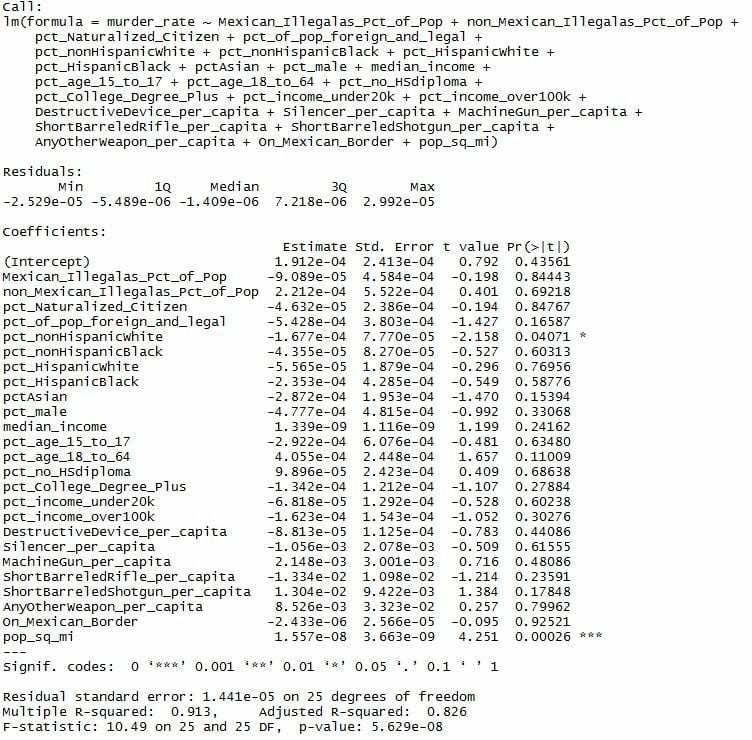 Visually, it’s obvious that in the later data, there is a lot more scatter. Also note that that big data moves post 1997 return to the continuation of the best fit line, pre-1997. I can think of two contributing factors. As wealth increases, the need to spend on basic necessities captures a smaller portion of that wealth, so the propensity to spend decreases. I’ll defer consideration of the other factor for now. 2) There was an upward trend that ended in the mid-70’s, underscored with a blue line. 3) Values after the mid-70’s, including the two bubbles, are contained in a down-sloping channel, outlined in green. 4) Except for the early 80’s and 90’s events, recessions are marked by sharp, temporary slope increases. Tim Duy weighed in on the output gap debate – not my topic, but he presented this chart of net worth as a percentage of GDP. I’ve argued already that, contrary to standard economic thought, consumption is directly determined by income. (Posted at RB and at AB.) One observation was that consumption, as a fraction of income, didn’t vary much over time, averaging 90.1% with a standard deviation of 2.1%. Graph 3A spans from 1959 – the beginning of the data set – to 1979. Net worth rises exponentially as the population grows. Adjusting for population growth does not change the shape of the net worth curve, so, in the aggregate, we were becoming richer during those years. Note that PCE/NW follows a generally similar, though far bumpier trajectory. As I pointed out in the prior post, the personal savings rate also increased during this period, so the average worker was able to both save and spend more. Graph 3B spans from 1975 to 1990. Net worth continues on its exponential track. But, after about 1979, PCE/NW drops, reversing the prior trend. By 1990, PCE/NW is no greater than it was in the early 1960’s. Meanwhile, the personal savings rate also dropped – to a range below that of the early 60’s. What narrative makes sense of these three graphs? Here’s my attempt. Through the 60’s and 70’s, the standard of living was increasing, as incomes and net worth rose together. This allowed more discretionary spending, and therefore, the fraction of NW that was spent increased. In the 80’s, aggregate net worth continued to rise, but consumption spending, quite dramatically, failed to keep pace. Lane Kenworthy has repeatedly pointed out that middle class income growth has decoupled from general economic growth as the upper income percentiles have captured an increasing slice of total income. As the wealthy grew wealthier and the middle class fell behind, the fraction of NW that was spent declined – exactly the opposite of what should happen if increasing wealth determined spending. But exactly what should happen if increased wealth is diverted to the already wealthy who have less of a propensity to consume. During the 90’s, growth in median family income and GDP per capita were close to parallel (see graph at the Kenworthy link) so there was a lull in the decoupling. For most of that decade, PCE/NW was close to constant at 0.18-.19. But while spending was kept level, the personal savings rate continued to fall. There was a tight relationship between Net Worth and consumption through the 60’s and the 70’s, when earnings growth kept up with GDP and wealth disparity was slight by current standards. This relationship broke down during the 80’s – though one could argue as early as the mid 70’s – as aggregate wealth and working class income decoupled. In part 2, we’ll look at how spending and Net Worth correlate. Part I showed the money going to corporate profits, not to the salaries of working people. Part II showed that the finance sector has captured an increasing slice of the profit pie. Here is a different look at where the money hasn’t gone. I’ve left the 50’s out of the argument (but not the graph,) as a courtesy to Ike, since his relative performance suffers due to the post war baby boom. The population grew at an above normal rate for over a decade, and that skews the GDP/Cap data. If you’ve been paying any attention to time series economic data, you know there are break points in almost any econ measure, somewhere in the vicinity of 1980. I’ve added trend lines, breaking the data sets arbitrarily at 1980. These trend lines here tell the same story – it’s deja vu all over again. Pre-1980 trend lines start with 1960 data. I stopped the post ’80 trend line data sets at 2007, to avoid the influence of The Great Recession, which would have have further deceased their slopes. What I want to emphasize here is the difference between the two lines. Though both have a knee, the Disposable Income break is much sharper. Here is a graph of the difference between the two, linear scale. And, BTW, this time I left the ’08 and ’09 data in the trend line determination. Well – since 1980(-ish) not only has GDP growth slowed, the amount captured in disposable income has decreased, quite dramatically. That’s a whole lot of wealth that is NOT ending up in the hands of ordinary people. Which is why it doesn’t get spent. But that is another story. An earlier version of this post was published at Retirement Blues, back in June. In this post, earlier today, I forgot to link to this article over at Naked Capitalism. The salient point is, that specifically for investors, spending is related exclusively to income, never to wealth. It goes on to posit that QE and monetary policy are killing demand.